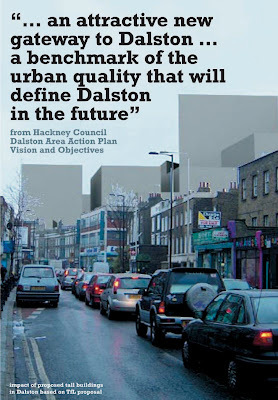 OPEN Dalston: "It goes right to the heart of the lives that people lead and the legacy we leave to future generations." "It goes right to the heart of the lives that people lead and the legacy we leave to future generations." "To call attention to the case for encouraging high-quality architecture in the UK and for ensuring that design quality is taken into account by local Planning Authorities; and to move for papers"
"My Lords, in my maiden speech in this chamber I expressed the hope that we might have an opportunity of discussing issues of planning and housing in London before too long, and so I am particularly grateful to the Noble Lord, Lord Howarth, for giving us this opportunity today. It is certainly badly needed. For what we are talking about goes right to the heart of the lives that people lead and the legacy we leave to future generations. As the RIBA (Royal Institute of British Architects) has said: "Design is about much more than aesthetics. It is functional, sustainable and gives pleasure. It attracts people, investment and activity to places, and brings social, environmental and health benefits." 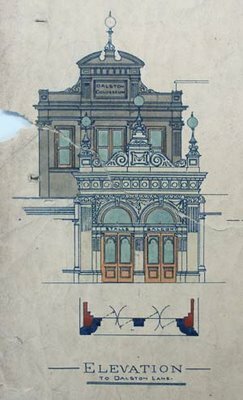 1898 architect's design for the new theatre entrance, built forwards from the original 1886 circus entrance, at North London Colloseum and Amphitheatre, 12 Dalston Lane, London E8. But of course what is needed is not just a debate. As the RIBA go on to say, design should be one of the most important considerations in new development, and the Planning Bill should be used to entrench design into the planning process. There should be a statutory duty to consider the design quality of planning applications, and local authorities should be encouraged to establish local design review panels or appoint local design champions. I would support this, so long as the local community was represented and not just the "experts". Both the Barker and Calcutt Reviews endorsed RIBA's recommendations, and it would be good to hear an assurance from the Minister today that the Government will take these forward. But it is not just a matter of institutional reform. There needs to be a sea-change in the culture surrounding the planning process, away from one dominated by the values of hard-faced accountants to one concerned more with quality of life and user involvement. In my maiden speech, I hinted at the baleful influence of the planning policies of the London Borough of Hackney on the lives of the residents of Dalston, where I live. The protocol surrounding maiden speeches precluded my going into greater detail on that occasion, but today I am under no such constraint. 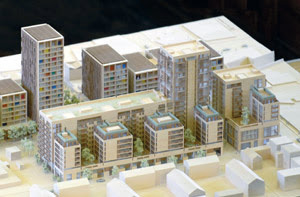 If I may, therefore, I shall describe for your Lordships our experience in Dalston, as I believe it throws into sharp relief much of what is wrong with development today and what accordingly needs to be put right. Let me straightaway declare an interest as a Patron of OPEN, a not-for-profit company of local individuals and businesses committed to promoting excellence in the quality of the built environment. When we heard that Dalston was to be regenerated, we had high hopes that this derelict, neglected and overcrowded area of East London would rise as a modern phoenix. 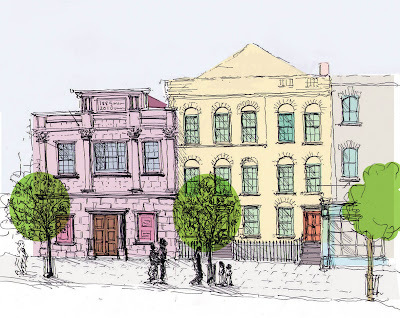 We anticipated that our few remaining historic buildings would be given a new lease of life and inform the proposed development around them. How naíve we were. Dalston's historic buildings - despite 30 years of Hackney Council ownership the buildings had survived: the pair of 1820's Georgian houses, the original 1886 circus entrance, the 1898 new Theatre entrance in front of it (which became the Club Four Aces) and Dalston Theatre behind. My Lords, the proposed development consists of two adjoining sites. The driver of the whole project is a site owned by TfL (Transport for London)who are building a new transport hub said to be vital for the Olympics. But there is no direct link to the Olympic site. Had it been 300 yards further on at Dalston Kingsland it would have linked directly to Stratford as well as being much closer to the commercial heart of Dalston. When we protested about this to the London Development Agency, their reply was that this was by no means the only transport hub which was mislocated in this way. A massively expensive concrete slab over the railway will accommodate an unnecessary and potentially dangerous bus stand, where current routes will be cut short. TfL deployed a kind of circular argument: the bus stand is necessary to enhance the scheme and the scheme is necessary to finance the bus stand. A brutal phalanx of tower blocks of up to twenty storeys will be erected on the slab to help pay for it. These will blight the environment and bring no benefit to the area. Of their 300-odd dwellings, none is to be affordable. This is in direct contravention of the Government's policy as affirmed both in this House and in another place. But when we asked the Secretary of State to use her powers to review the scheme, we were simply told that the transport hub was essential of the Olympics. The adjoining site is being developed by the LDA (London Development Agency). It has similar disadvantages, and moreover is aesthetically and architecturally unrelated to its neighbour. Together they represent the worst type of unimaginative and destructive town planning. No more health and other services are to be provided for the 550 extra households in total. Such high density in an already over-crowded and under-resourced area completely ignores the potential for alienation, anti-social behaviour and vandalism. As a criminologist I know that this is not the way to build a housing estate. The two sites are separated by a strip of land overshadowed by the tower blocks creating a sunless wind-tunnel. This is the public space the inhabitants of Dalston will have to make the best of for their leisure. Both schemes will be divorced from proposed developments on the other side of the road in a kind of piecemeal development which lacks any kind of coherence. Instead of design-led regeneration, we have the prospect of a sink estate in less than a generation. My Lords, how has the travesty I have described come about? Three reasons immediately come to mind: The first is a poor understanding of what constitutes good architecture and design on the part of town planners and developers. High quality architecture and good design do not just consist of buildings. Buildings have context. The irony of a blind man lecturing you about architecture will not be lost on your Lordships. But I would say that good design appeals to all the senses. As a native of Edinburgh, I know about well-planned squares and streets, gardens and open spaces. In other countries, they manage these things better: some of your Lordships may, for example, be familiar with Montpellier in France, a city which has preserved its historic area yet has a modern quarter with a unified design, decent public space, trees and water features. You may say that they have more space in France, but even tightly packed New York has small pocket parks for the refreshment and enjoyment of its citizens. Second, consultation with the public was, to say the least, inadequate, even misleading. Nevertheless, local residents mounted vigorous opposition to the destruction of their heritage and the imposition of unlovely and unsuitable developments wholly out of character with the area. Their case was comprehensively ignored. The historic buildings were demolished and a modern Gormenghast will rise in their place. 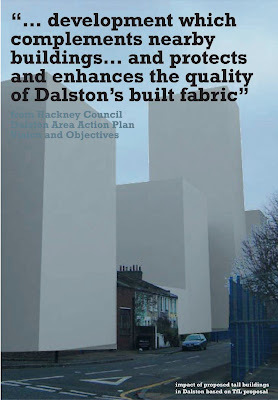 This was said to be a once in a lifetime opportunity for Dalston. Instead we are offered off-the-shelf, unimaginatively designed blocks of varying height, with no relationship either to the Victorian street pattern or to each other and with little aesthetic coherence. And this is the third reason: in direct contravention of planning guidance, these schemes have not preserved heritage buildings or enhanced the cityscape which remains. They meet neither of the Mayor's much-vaunted criteria that new housing should be built to the highest architectural standards and be 50 % affordable. The Council has waived social housing requirements, parking and space standards. The windows of inhabited bedrooms in adjoining blocks will be just five metres apart. 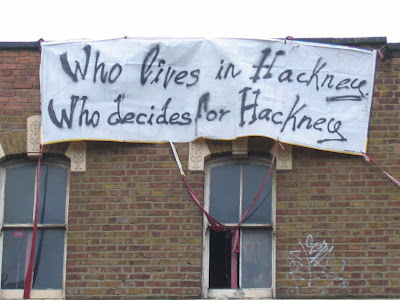 Hackney's official standard is twenty-one. 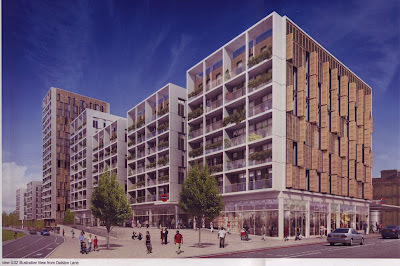 In order to fund TfL's bus stand the Council has also leased its site to developers on terms so unfavourable that they required the Secretary of State's consent. The Secretary of State refused to withhold her consent. Why should all this be? The answer lies partly in the need to meet external and undisclosed financial imperatives out of a misplaced fear that developers would otherwise walk away; partly in developers' ability to hoodwink poorly qualified planning officers into accepting substandard designs; and partly in the ability of multiple authorities in central and local government to evade responsibility with a cynicism which borders on the corrupt. My Lords, in a country of historically renowned architects and with present-day architects who are changing the face of the world, surely we can do better in our own back yard." A 10 year plan to destroy 185 years of history. 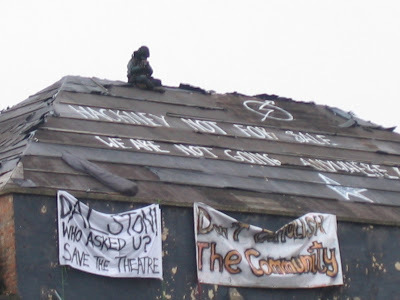 Read a brief history here: "The story that was never told"
A stunning microcosm of the awful disaster that was visited upon the people of Dalston and a formidable indictment of just how easily even the most articulate and organised of opposition to such proposals could be disregarded. Very many thanks to Lord Low for bravely continuing with a rearguard action in the interests of preventing similar mistreatment of other communities.